Essex County Place: How Should Newark Celebrate its 350th Anniversary? How Should Newark Celebrate its 350th Anniversary? Newark, New Jersey: Newark's 350th anniversary year is almost here. While the Newark History Society has already announced that there will several programs this year and next year regarding Newark's history, many of the plans have not been announced, as local leaders want your input. There will be community discussions regarding the 350th anniversary celebration in every ward. 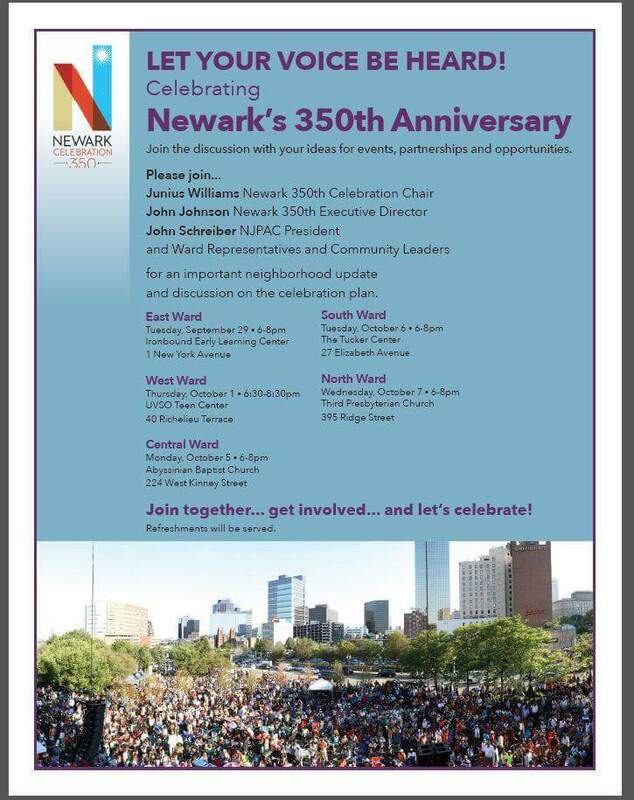 Newark Celebration 350 Executive Director John Johnson and Chair Junius Williams, along with New Jersey Performing Arts Center President John Schreiber, will listen to the ideas of residents and business owners.